The rod diameter of the body of the clip joint and the hole diameter of the plate were not equal, and it was not possible to stop the chain without passing through the chain. (Don't even go into the groove into which the clip is inserted. The diameter of the rod is larger than the hole of the clip.) After all the holes of 5.5 mm are drilled to the two holes of the clip. The Perhaps you are shipping a lot of other plates of the same size? It is bad because it can not be installed absolutely if you do not open the hole. This review is about item#61000256. As there was no tool that was big in the first chain change, I chose a chain with screw joint. The instruction was also polite and easy to understand, and the work was easy to do. The tie wrap attachment is also appreciated sober. It has nothing to do with this product, but I had a hard time cutting the original genuine chain. After installation, I ran, but I realized how the previous chain was in bad condition. This review is about item#61000265. As there was a detailed manual, it could be installed without any problem. I am very satisfied with the product. This review is about item#61000353. Using a normal chain about 10,000 km, will be replaced. The maintenance was on beans, but it was replaced because the normals were partially stretched. As I did normal bean maintenance as above, I did not expect too much, but still new rolling is completely different. I have purchased an STD color, so I have no custom feeling at all, but I am glad that I could purchase this performance at a low price. This review is about item#61000292. Screw joint is good. It was easy! It is a cousin to say, but I had a little struggle to break the pin at the end. I did not break it with my pliers, so I used 12 glasses to fold it in a leveraged manner. It can be used without any problems because it is an upgraded version of the new car installation. This review is about item#61000222. Please leave a cheap and highly durable chain. Also, please leave the model number of SRX for SRX riding. This review is about item#61000301. Safety and security, adequate performance. 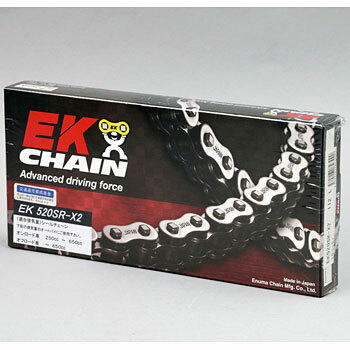 EK chain, it's great! I've been running out of order for about 3 months after changing the chain. I got cheaply good ones. This review is about item#61000125. This review is about item#61000177.